This round trip lets you see a lot of Tasmania in a relatively short period of time. It gives you the chance to compare the east and the west coasts, and to also experience the inimitable Cradle Mountain. Starting and ending in Hobart, it is the perfect introductory tour of Tassy. Hobart is where you begin your journey and pick up your campervan. You will want a day or more to explore this beautiful city, which sits on the mouth of the Derwent River. Begin the day with a morning climb up Mt Wellington, and enjoy the view of the sun rising over the city below. When you get back down again, visit historical suburbs such as Battery Point and Salamanca Place, or take a stroll through the serene Royal Tasmanian Botanical Gardens. A great way to see the day out is on a river cruise on the Derwent, drink in hand. There are plenty of caravan parks where you can park up for the night and get a good rest before beginning your journey. The west coast of Tasmania is rugged, isolated and beautiful, with Strahan being the only town on its entire length. The journey there takes you through the Franklin-Gordon Wild Rivers National Park along the Lyell Highway, a spectacular drive through immense pine forests. Strahan sits next to the sheltered waters of Macquarie Harbour, into which the Gordon and King Rivers flow. Enjoy water based activities on these smooth surfaces kayaking, fishing, boat cruises and the like. Pay a visit to the Morrisons Huon Pine Mill, and you cannot miss Ocean Beach, a 40 kilometre stretch of dunes and hard white sand. This leg takes you to the mountainous landscapes and stunning scenery of Cradle Mountain Lake St Clair National Park. Book your campervan into the Cradle Mountain Tourist Park, and spend a day enjoying the best of the Tasmanian wilderness. The high peak of Cradle Mountain is reflected in the still waters of Dove Lake below it, and we recommend taking the easy hike around the lakes edge. There are plenty of other bushwalks in the Park that take you past some amazing views. Fishermen will relish the opportunity to cast a line for a brown trout, and if 4WD enthusiasts may want to take a tour to the more rugged regions of the park. After a couple of days in the more remote regions of Tasmania, it is now time for a night in one of the prettiest cities in the world, Launceston. Deep in the heart of the Tamar Valley ('The Valley of the Senses'), Launceston sits at the point where the Tamar and South Esk Rivers meet. A tour of the wineries in the valley is essential, as it will give you the chance to experience the natural beauty of the region as well as enjoying the local fruits of the vine! Don't miss the chance to go on a tour of James Boag's Brewery either, a novel experience for all age groups. This drive takes you through the colourful east country to the Freycinet National Park, home to such icons as Wineglass Bay and the Freycinet Peninsula. The town of Coles Bay is the best place to find a tourist park for your campervan, and is close to all the attractions of the region. The countryside here is perfectly suited to bushwalking, so enjoy hiking amongst the Granites, and definitely pay Wineglass Bay a visit. Near the town of Bicheno Bay are the Freycinet and the Whalers Lookout, both which provide you with great photographic opportunities. This is a scenic drive down the east coast, right down to the tip of the Tasman Peninsula where the historic town of Port Arthur sits. In the early colonial days Port Arthur was the largest penal settlement in Australia. Its dark yet rich history is preserved in the Port Arthur Historic Site, where the ruins and old buildings of the early colonial days have been preserved as a cultural relic. You can spend hours browsing through the beautifully maintained gardens and the museums that will transport you to a different time. At night time ghost tours are a chilling yet exciting idea, although be sure to book in advance. 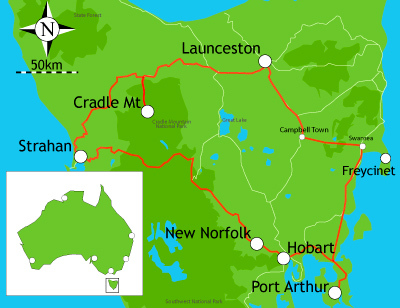 Its only a short run on to Hobart from Port Arthur, so spend the day enjoying the beautiful Tasman Peninsula. The scenery here is as dramatic as the history of the region, and it is no wonder it is registered on the National Estate. The coast is a mixture of tall cliffs, secluded beaches and rocky inlets that are great for exploring on foot, or if you are feeling adventurous in a canoe or kayak. There are over 35 designated bushwalks on the Peninsula, so hikers really are spoiled for choice. After a day appreciating the outdoors, head off to Hobart and enjoy looking back on your adventurous journey!